Last October, Scott and I packed up the car and headed up to one our favorite camping areas (Guanella Pass) for a weekend of mountain air and hiking. We set up camp quickly and he put together his fly rod as soon as we finished. Our camp was right next to a set of ponds, and since we could see the tiny fish jumping away as we set up, he was anxious to throw his line in the water. Scott managed to hook a little Brook Trout (what I'm guessing/have been told it is) within a few casts. He was extremely excited, dare I say giddy even, as it was the first fish he'd hooked on the fly in Colorado. He spent the rest of the evening fishing, pulling in quite a few of the tiny fish. As usual, I was content snapping away the entire time. When the sun went down, we bundled up in our tent (it was quite the cool night) and read for a bit, before going full mummy mode in the sleeping bags and going to bed. I was about to settle in myself on that night, but noticed how perfect the light from Scott's headlamp was lighting the scene, and had to get a few images before calling it a night. Next up: day two of this trip which involved more fishing, and more time in the tent. I promise, the images are more exciting than that sounds (or at least I think they are). As always, thanks for stopping by! Feel free to share via the links below, and say hello as well! Well, I fell behind again. But, in my defense, I was off on an "adult spring break" (i.e., a long weekend), and wanted to give myself a slight break from technology. I am back at it now though, and will be wrapping up the Lime Creek Canyon trip with this post (finally). I'm going to keep this one short and simple in terms of writing, and leave you with the images. Just one quick note before I dive in; there are some large panoramic images below, so I would highly recommend clicking on those (which opens them in a lightbox) in order to see all their glorious details as large as possible. I hope you enjoy! Up next: More camping adventures, this time from Guanella Pass. Thanks for stopping by! My second favorite set of images from last year is quite different from the engagement shoot of the last post. Over labor day last year, a friend from Kansas and his brother came out to Colorado for a camping and climbing trip with us. This adventure took us to what quickly became one of my new favorites spots. Driving into the canyon (Lime Creek Canyon) was like a scene out of a movie. We arrived right as an afternoon thunderstorm was moving in, with low, heavy clouds rolling over the surrounding hills. It started to downpour, with thunder booming close. The storm only lasted a few minutes though, and once the rain stopped we quickly piled out of the car and set up camp, in case another storm rolled in. I let the guys handle setting up the tents (there were three of them, after all), so that I could wander around grabbing images of the stunning setting. After camp was set up, we went for a brief hike to explore the area. The clouds started to clear up as we hiked, creating some of the most amazing light that I have ever seen. We were pretty damp from hiking around after a complete downpour, but it was all completely worth it. The evening ended with a sunset fit for a dream, putting an exclamation point on the start of our trip. Next week: Part two of the Lime Creek Canyon camping trip, with even more amazing views. Slowly but surely I WILL get caught up on the huge backlog of images I have. Be sure to click the "subscribe" button off to the left in order to stay in touch! And as always, thank you for stopping by! Happy day after Thanksgiving everyone! I was able to spend yesterday with most of my family, enjoying some precious time with two of my nephews, and eating lots of food of course. I hope everyone had a day filled with loved ones and delicious food. It is time for another round of images that have been sitting on my hard drive for close to two months! I've been telling myself lately that because I am awful at posting here on a regular basis, it makes the posts more treasured and worth viewing. Hopefully there is at least some truth to that. Back at the end of August, Scott and I went fly fishing for the first time in Colorado. Scott of course did all the fishing, as I was perfectly content wandering around photographing the stunning setting. I actually had to admit to a new friend (who is an avid fly fisher, and I met at a fly tying event) that I have never fished on a fly rod before. I always get sidetracked and distracted by the opportunities to photograph, and haven't even taken the time to learn somehow. On this particular occasion, we ventured to Walker Ranch, to fish in the South Boulder Creek. Scott had read the fishing reports, and it looked extremely promising. I was excited, since we were going to a new location, and it ended up being amazingly beautiful. Unfortunately the fishing report ended up being quite wrong for us that day. We didn't so much as see a single fish. Scott progressed downstream, hoping to get some bites, with no luck. I, of course, was still more than content, but he ended up fairly frustrated towards the end of the afternoon. Next up on the blog: images from my current favorite location in Colorado. Expect to see some mind blowing light, quirky portraits, and movie like landscapes. My first weekend living in Colorado (two months ago at this point!) was lived to the absolute fullest, and in true Colorado style. My best friend's birthday fell right after that weekend, so we decided to go on a camping trip to celebrate her birthday, as well as the fact that we would be living in the same state for the first time in eight years. We camped near Twin Lakes for two nights, and hiked Mt. Elbert, the tallest fourteener in Colorado, while we were there (images to come). We ended up having perfect weather for both days that we were out there, and somewhat spontaneously ended up on a beautiful hike the evening that we arrived. These images are from that hike, which followed along the edge of Twin Lakes. The hike took us to the historic Interlaken Hotel, a resort that was built in the late 1800s. It was a popular resort for many years, and was quite the luxurious get away at the time (featuring a six-sided privy with leather seats, and an orchestra performance once a week). The resort closed in the early 1900s, and when they built the dam on Twin Lakes in the 1970s, many of the buildings and artifacts were left behind, flooded by the new water level. However, some of the buildings were moved in order to preserve them, including the summer home of the owner of the resort, James Dexter (the first few images below). The Dexter House is open to the public, and we were able to walk through the beautiful building, all the way up to the glass enclosed cupola (which has 360 degree views of the lakes and mountains). You could easily tell it was once a rather lavish place. For example, Dexter imported eight different types of wood for the floor of his home (which you can see below), in order to make it look more Victorian. I can only imagine what this place would have been like in its prime, with an orchestra playing, a steamboat ferrying people to and from the resort, fine dining, and luxuriously furnished rooms. Sitting on the porch of the Dexter Home was a hiker who we ended up chatting with for a little while. It was the first time that I worked up the courage to photograph a stranger, and it was great to listen to his story as I snapped a few images (though unfortunately I failed to get his name). 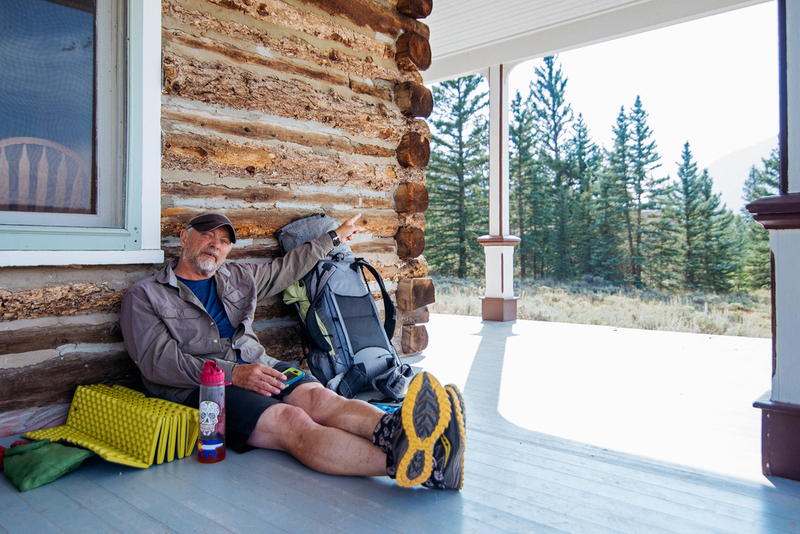 He had started hiking in Durango, Colorado, hiked over the Continental Divide, and was now resting for a little in Twin Lakes. So far he had hiked for four weeks, and was planning on going all the way to Denver. Depending on his exact route, that would be around 325 miles of hiking! Next up, images from my first fourteener! Expect stunning mountain views, and more adorable pictures of the puppy. Thanks for stopping by! The longing for a visit to the Red River Gorge continues. In fact, re-editing these photos has made we want to go back that much more. These images were from a separate hike from the last post, which ended up being kind of a unique hike with very diverse landscape types. There had been a fire on the ridge at the start of the hike, so the landscape there was a bit harsh and desolate. The branches were twisted, and almost grotesque looking at times. After hiking for a bit, the view really opened up, and things became green once again. The photo below isn't the highest in quality (these were taken back when I had a lower quality camera, unfortunately), though it does a nice job of showcasing the green landscape, and the vastness of the forest in the area. The image below was a favorite spot of mine, and was one I photographed more than once. In fact, one of my favorite images from my undergraduate film photography classes was of these trees. I ended up making a large print in the darkroom, and one now hangs on the wall in my parents' home. Unfortunately I don't have quality documentation of it (scan or photograph), so this digital file will have to do for sharing. After walking along the top of the ridge for a while, the trail heads down and follows the bottom of the gorge, providing a dramatic change in scenery. Trees towered over me; the leaves so thick that sunlight barely filtered down. The air was much cooler and more damp, and a creek flowed along much of the trail if I remember correctly. It was difficult to photograph without a tripod since there was so little sunlight there in fact. This will likely be it for the Red River Gorge posts, at least for the time being. I hope to be back there for a brief trip this fall, so maybe new photographs will surface then. Be sure to click on the "Subscribe" link on the left to keep in touch, and feel free to share! In the mean time, happy Friday! Happy Father's Day in advanced to all you dads out there, and have an excellent weekend!